Heat grill to medium-high heat. Season ground beef with a pinch of salt, black pepper, and a few dashes of Worcestershire. Divide ground beef into 3 equal portions and divide each portion in half. Form each ball of ground beef into a patty. Top 3 of the patties with 2 Tbsp cheese, 1/3 of the chiles, and then a second patty. Pinch the patties around the edges to seal well and lightly press into a uniform burger patty. Cook on the grill 4-5 minutes each side, until cooked to desired doneness. 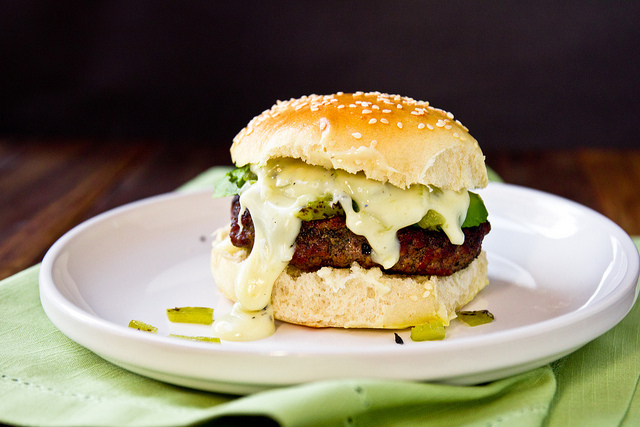 Assemble on buns and top with sliced avocado and a scoop of queso.